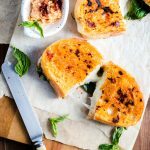 A unique take on the classic grilled cheese, using fresh basil, fresh mozzarella and an unami-filled sun-dried tomato butter crust. Slice the mozzarella and place on a paper towel to drain while you make the butter. Place the softened butter and sun-dried tomatoes in a food processor or blender, and blitz until well combined. Heat a large frying pan over medium-low heat. For each sandwich, spread 1 tbsp of sun-dried tomato butter over the outside of two slices of bread. With the butter side facing down, add a layer of basil and a quarter of the mozzarella (50g), then top with the second slice of bread. Grill in the pan for several minutes on each side, until the bread is toasted and cheese is melted. Enjoy!